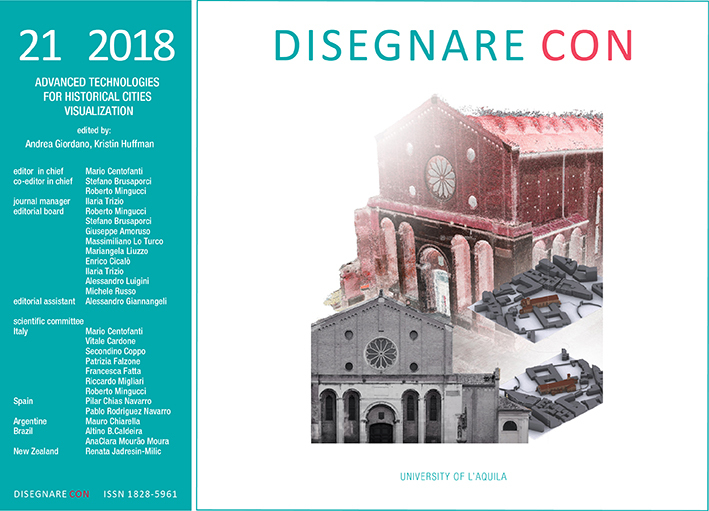 "DISEGNARECON” is an international, on-line, free and open access and blind peer reviewed scientific journal focused on researches and case studies in the field of architectural heritage design, representation and communication. It invites submissions on these topics and promotes discussion and debate between scholars from Engineering and Architecture Schools. The journal is published by the University of L’Aquila (Italy). Scientific committee: (Italia) Mario Centofanti, Vitale Cardone, Simonetta Ciranna, Secondino Coppo, Patrizia Falzone, Francesca Fatta, Riccardo Migliari, Roberto Mingucci ; (Spagna) Pilar Chias Navarro, Pablo Rodriguez-Navarro; (Argentina) Mauro Chiarella; (Brasile) Altino Barbosa Caldeira, Ana Clara Mourão Moura, (New Zealand) Renata Jadresin-Milic.